DALLAS - The family of a 14-year-old Muslim student who got in trouble over a homemade clock mistaken for a possible bomb withdrew the boy Monday from his suburban Dallas high school. Ahmed Mohamed's father, Mohamed El-Hassan Mohamed, said he has pulled all of his children from their Irving Independent School District schools. Mohamed said the family is still deciding where to send the children to school. 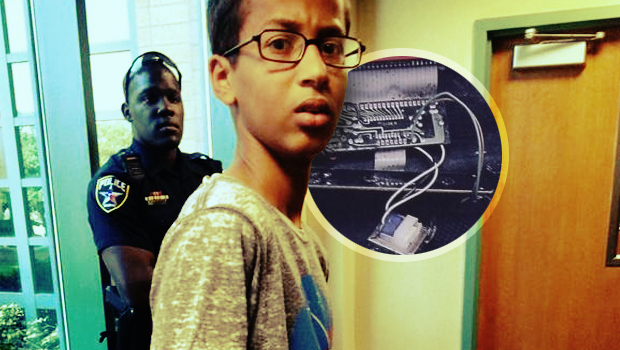 Ahmed has said he brought the clock he made to MacArthur High School in Irving last week to show a teacher. Officials say he was arrested after another teacher saw it and became concerned. Ahmed wasn't charged, but he was suspended from school for three days. "Ahmed said, 'I don't want to go to MacArthur,'" Ahmed's father told The Dallas Morning News. "These kids aren't going to be happy there." News of the arrest sparked an outpouring of support for Ahmed, including from President Barack Obama. The turmoil surrounding Ahmed's case has had a harmful effect on the teen, Mohamed said, adding that his son has lost his appetite and is not sleeping well. "It's torn the family and makes us very confused," Mohamed said. Numerous schools have offered to enroll Ahmed, his father said. But Mohamed said he wants to give his son a breather before making a decision. In the meantime, Ahmed has been feted throughout the tech world. CBS San Francisco reports he was the VIP at a Google science fair when invited to their California campus on Monday. Ahmed's father said his entire family plans to fly to New York on Wednesday, where United Nations dignitaries want to meet his son. Then, if the appropriate visas can be obtained, Mohamed wants to take his son on a pilgrimage to the holy city of Mecca in Saudi Arabia. "I ask Allah to bless this time. After that, we'll see," Mohamed said. When they return, a visit to the White House and a meeting with Obama is in the works, he said. Irving Police Chief William Boyd said the teen had been handcuffed "for his safety," while admitting there is "no evidence to support the perception that he intended to create alarm." Still, the chief defend police actions that day. "That is a very suspicious-looking device," he said. "We live in an age where you can't take things like that to school." One of the largest Muslim groups in Texas said it does not fault police and school officials who handcuffed and suspended Mohamed. Instead, Khalid Hamideh of the Islamic Association of North Texas blamed political leaders for espousing inflammatory anti-Muslim rhetoric and creating a "climate of fear." "We're not pointing a finger at the school district or the police department," Hamideh said. "Under the current climate that exists in this country, you can't really blame them because when they see something like that, they have to react."